Three of the best perks to having a clean office are what we like to call the “3 P’s”: Popularity, Productivity, and Profit. Being known around town as the cleanest, healthiest, and nicest looking business could play a huge role in gaining more customers…aka popularity. How about less sick days? More time in the office means more productivity is occurring. With a growing clientele and energetic staff, more profits are being made. You can’t go wrong with any of that! Professional cleaning teams can help you and your business in the long run. Keeping high janitorial standards and a good reputation is key in gaining popularity. Having positive feedback about the cleanliness of your company’s building could attract more customers to visiting your place of work. Don’t allow filth from deterring potential business. Word of mouth can spread rapidly. Let the rumors be true; that you’re business is impeccably nice and clean! To be known as a beautiful facility will ultimately result in attracting new clientele. A healthy office means less sick days and an overall cleaner atmosphere. A decluttered, dust free, and sanitized space will allow your workers to have more energy and focus on their own work. Bad germs and bacteria are removed with the help of a professional cleaning staff. Productivity is fundamental in keeping the business running. Therefore, consider a germ-free, clean space for your employees and customers to be operating in. Become more profitable by simply hiring a janitorial service to control the cleanliness of your facility. By sustaining the 2 other “p’s” (popularity and productivity), your business will thrive. A growing company brings in more revenue and riches. 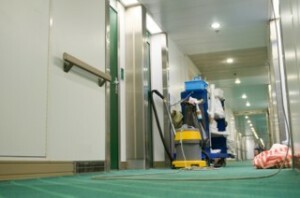 A janitorial company’s goal is to make sure your facility is pristine clean to conclusively create a successful environment for your business. Apple Corps’ experienced cleaning staff can help your company become more popular, productive, and profitable. Call today for a free cleaning quote 781-335-6900.